There are so many options for enjoying Christmas and New Year’s in and around Colorado Springs. The engaging events below just scratch the surface of the wonderful holiday experiences this town has to offer. The Colorado Springs Philharmonic will be offering up a Christmas Symphony on Dec. 17 at 2:30 pm. Performing Christmas classics such as We Three Kings and Let it Snow! Let it Snow! Let it Snow!, it’s sure to satisfy the Christmas carol lover in you. Shake it up with jazz and “old style” rock on New Year’s Eve starting at 7:30pm and bring in the New Year with a balloon drop and great tunes! Enjoy a tasty Bavarian Christmas Dinner in nearby Manitou Springs on Dec. 17. Bavarian fare and entertainment abounds as you support the Colorado Springs Philharmonic. The Glen Eyrie Castle was built by Colorado Springs founder Jackson Palmer. This lovely historical landmark has exciting offerings for the holiday season. Though the Christmas Madrigal Banquets are sold out, there is still limited seating for the Acoustic Eidolon Concerts scheduled on Dec. 28 at 4:00 pm and 7:00pm. Joe and Hanna Scott present Heart to Hearth, Songs of Christmas for their delighted guests. And there’s still time to reserve a spot for Glen Eyrie’s New Year’s Eve Gala. This event offers live music, dinner and dancing from 6:00pm to 11:00pm on Dec. 31st. 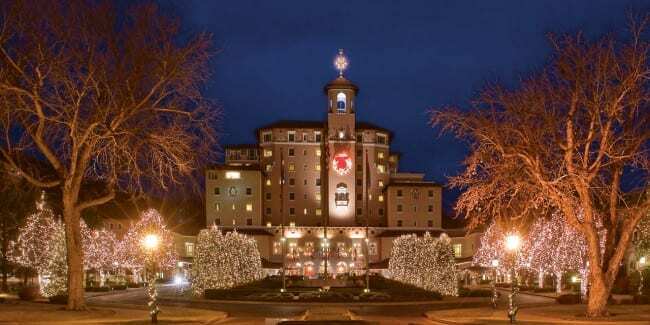 For a traditional Christmas celebration with elegance and style, turn to a Classic Broadmoor Christmas dinner show. Choose from a number of dates from the 12th though the 24th. Don’t miss out on the Broadmoor New Year’s Eve Gala. Dinner, music and dancing starting at 7:30pm. Ring in the New Year right! If family fun + recreational activity is on your Christmas wish list, check out the many Holiday-themed Nature Center activities planned for this month: Hike with Santa, The Gingerbread Man, Audubon Christmas Bird Count, Rudolph’s Relatives and Horse Drawn Wagon Rides. Imagine the smiles! For the animal lover – or just the kid in you – celebrate the season with the Electric Safari. 24 years and still going strong! Beautiful lights, magical memories. Looking for comedy and theater to round out your holiday season? Check out The SantaLand Diaries or The Last Christmas Tree at ART and laugh yourself giddy. And if you’re looking for New Year’s Eve entertainment for the whole family, ART has that covered too with Mr. Guffaw. Don’t forget The North Pole when making your Christmas activity list! No Colorado Springs holiday itinerary would be complete without a visit to nearby Santa’s Workshop for a magical amusement park Christmas experience. It’s even open Christmas Eve from 10:00am to 4:00pm. Please share any other holiday events in Colorado Springs below!